Style #4680 Buckeye [4680 Buckeye] - $97.99 : Sogowear Outfitters!, Polo Shirts, Golf Shirts, Jackets, Fashion Fleece, Woven Shirts and More! 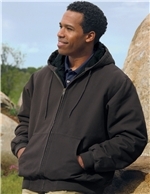 The 4680 Buckeye hooded jacket is constructed of a peached heavyweight 11.4 oz. cotton canvas body with a 4 oz. Poly-fill quilted lining. Enzyme wash provides a weathered appearance. Also features two front pockets, an inner zippered chest pocket and a cell phone pocket with Velcro closure. Ribbed cuffs and waistband provide a custom fit. Sizes: S, M, L, XL, 2XL, 3XL, 4XL.